Close to 400 products were generated through the various research projects coming out of the Canadian Social Economy Research Partnerships (CSERP). This body of research is a substantial contribution to understanding the history, the current context, and the future of the social economy in Canada. 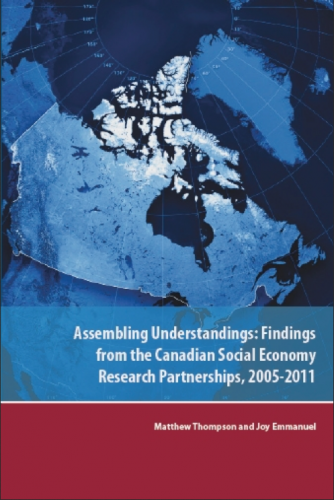 With Assembling Understandings, the Canadian Social Economy Hub has developed a thematic summary of the CSERP outputs, exploring the following dominant crosscutting themes within the research findings: Mapping, Social Enterprise, Co-operatives, Indigenous Peoples, Organizational Governance & Capacity, Social Finance, and Public Policy. What emerges with Assembling Understandings is a detailed snapshot of the remarkably robust and innovative nature of Canada’s social economy, and demonstrates where key developments can potentially have a significant influence on the continued economic growth and social impact of the sector.